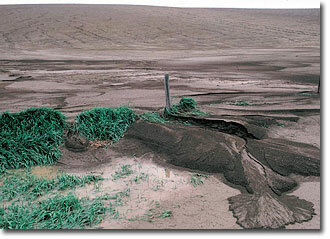 Worldwide, loss of topsoil is a critical environmental problem. We are pleased that Sonoma Compost and our mulches are recognized as important tools in the local battle to minimize erosion. Our products are used on steep hillside vineyards, along waterways and on private residential properties. To effectively minimize erosion, mulch must stay in place and hold up to the elements for an extended period of time. It's also helpful if it's light and easy to spread. Finally, as it slowly decomposes, good mulch will provide the underlying soil with organic matter, nutrients and microorganisms that will build soil structure and provide a growing environment for seeds and plants that will further resist erosion.